Parisian women coming home at night have been savagely murdered by a mysterious serial killer, creating a city-wide panic. The harried Inspector Lagrume thinks he has found the culprit in the person of Barberot, a local butcher. But Commissioner Maigret, who takes over the investigation, is not so sure: deep down, he senses that the murderer is still at large. But: how to trap him? (1958) 118min. Directed by Jean Delannoy. Adaptation by Rodolf-Maurice Ariaud, Michel Audiard & Jean Delannoy; dialogues by Michel Audiard from the novel by Georges Simenon. Photographed by Louis Page. Edited by Henri Taverna. Music by Paul Misraki. With Jean Gabin, Annie Girardot, Jean Desailly Olivier Hussenot, Jeanne Boitel, Lino Ventura, Lucienne Bogaert, Jean Debucourt, Guy Decomble, Jean Tissier, Paulette Dubost, André Valmy. 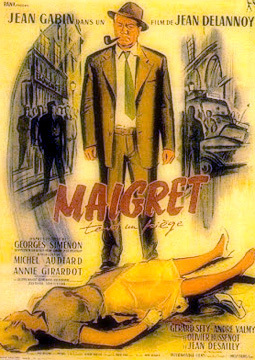 The great Harry Baur adds the nuance to Maigret that was only latent in Simenon's early novels—a temptation to inhabit the mind of the criminal he's pursuing—and he creates a road map for all those who followed him in the role as a man on the edge of being too caught up in his own game of cat-and-mouse with his quarry. 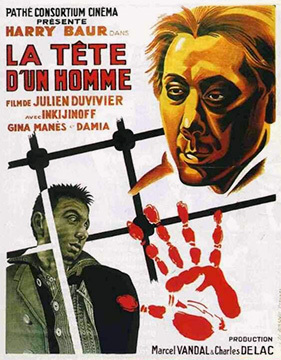 Julien Duvivier gives early French noir a shove past mere criminality and takes it headlong into the derangement lurking within the modern world that can turn anyone into a bête humaine—if the circumstances are "right." (1933) 90min. Directed by Julien Duvivier. Screenplay by Pierre Calman, Louis Delaprée & Julien Duvivier from the novel by Georges Simenon. Photographed by Armand Thirard. Edited by Marthe Poncin. Music by Jacques Dallin. With Harry Baur, Valéry Inkijinoff, Alexandre Rignault, Louis Gauthier, Henri Échourin, Marcel Bourdel, Charles Camus, Gina Manès, Missia, Oléo, Damia, Line Noro, Jean Brochard, Jane Pierson.